You workout to tear your muscles down; that’s literally what’s going on inside your body. With every rep, you break up muscle tissue in order to rebuild them stronger and better equipped to tackle the same tasks next time. Rep ‘em, get your muscles nice and sore, recover for a few days, repeat. That’s how it’s always been. But what if you could do this process more efficiently? With less muscle soreness and faster recovery? Or it’s a supplement called beta-Hydroxy beta-Methylbutyrate acid (mercifully referred to as HMB) used for just that purpose. 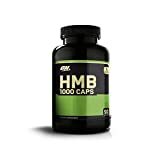 In this article, we’ll let you in on what HMB really is, what it does for you, what foods have high amounts of HMB, how to supplement, whether HMB is better than BCAAs, and review the best HMB supplements on the market. For the nitty-gritty, read on. 2 What Are The Benefits Of HMB? 3 What Foods Contain HMB? 4 How Much HMB Should You Take Daily? 5 When Should You Take HMB? 6 How Long Does It Take For HMB To Work? 8 Is HMB Better Than BCAAs? HMB is the broken down version (what is called an active metabolite) of leucine, one of the essential amino acids. Actually, only 5% of our leucine is naturally transformed into HMB. Your body uses this chemical to protect and repair your current muscle tissue. Specifically, HMB is “slowing muscle protein breakdown and speeding protein synthesis,” which is what amino acids are supposed to do. HMB also “preserves the structural integrity of your muscle cells,” so they don’t completely disintegrate when you complete a vigorous workout. Technically speaking, when comparing HMB to the parent amino acid leucine, the former is more potent in aiding the rate of muscle protein breakdown, and the latter is better for ramping up muscle protein synthesis. So, HMB is thought to be anti-catabolic rather than anabolic. Basically, it is better for reducing muscle breakdown than for increasing muscle mass. If you’re looking to increase strength, HMB can play a small yet vital role in increasing muscle mass. If you’re into endurance sports, such as cycling, running, or swimming, HMB speeds up the improvements in performance. When it comes to compound lifts – squats, incline bench, deadlifts, etc. – HMB aids in your strength training. HMB reduces recovery times for most workouts, as well as recovery times for injuries. Could play a part in reducing cholesterol and blood pressure. Sports athletes, or those who have to implement multiple types of fitness (flexibility, strength, power, endurance, speed), are the ones who will benefit the most from HMB. So Olympic athletes, those who participate in individual or team sports, and CrossFitters get the most bang for their buck. Because these are athletes who regularly get sore (WODs have us dying every time). Plus, HMB works no matter what mode of fitness you are training for. For example, if you are focused on strength training, your strength will improve; if you are looking to improve your endurance, HMB helps increase your VO2 max. If you’re a CrossFit athlete, you’re trying to be the ultimate athlete, improving all types of fitness. Therefore, HMB will aid in all facets of fitness. Note: If you don’t train hard or are so advanced where your adaptation to training is small, these benefits decrease. So, if you aren’t training hard, start training hard! For elite athletes, just know HMB won’t give you the same results as a newbie in the gym – the sad truth of diminishing returns. Dietary leucine converts a tiny portion into HMB. The rest of our HMB requirements come from foods high in the metabolite and supplementation. So, after the small percentage of leucine turns into HMB and you get a tiny amount from your diet – that is, if you get enough grapefruit, catfish, and alfalfa in your daily consumption – it’s best to supplement. How Much HMB Should You Take Daily? For the average individual, it is recommended you intake 3 grams of HMB everyday. You can actually scale your dosage based on your bodyweight. 17 milligrams per pound is the key. So if you’re 150, about 2.5 grams will do the trick, while someone at 225 is getting closer to 4 grams. Play with the dosage in safe amounts, never exceeding 5 grams. It’s unnecessary. When Should You Take HMB? Your dosage, no matter the amount, should be split between two or three equal servings taken throughout the day. For the best performance results, take one of those servings an hour before your workout, to prevent extra muscle tissue breakdown. If not before, take one immediately after, to reap as much of the benefits as possible. How Long Does It Take For HMB To Work? Your supplement should enter the bloodstream instantly. As for seeing tangible results, it takes anywhere between 2 – 4 weeks. This is for muscle mass gains. For aerobic improvements, the time period could very well be similar, but there’s less research on the benefits of HMB and cardio workouts. You can easily bank on seeing changes within a month’s time. Creatine increases the availability of ATP (muscle energy) and enhances your recovery. It only makes sense to pair this with HMB to maximize strength and muscle gains. The reason why you should combine the two supplements for increasing muscle mass and strength is that they both provide the body with natural ways to optimize your workouts and recovery, yet in two ways. The research shows creatine and HMB do the same thing differently, so combining them only enhances the benefits. This is a tough argument because they provide you with unique benefits. When we’re talking about BCAAs, we mean supplements with the three branch-chain amino acids: Leucine, valine, and isoleucine. Leucine, the parent amino acid of HMB, of course, gives you different benefits because only 5% of the amount will be turned into HMB, while the rest goes towards muscle protein synthesis. So, BCAAs are better, right? Not necessarily. You have a choice to make, then: You can use both supplements (which starts to get costly), or you could go with straight HMB and preserve more of your hard-earned muscle and go slower with the protein synthesis. The choice, of course, is up to you. Potentially, there are no side effects. There have been extensive studies on HMB to determine whether or not it’s safe for typical adult athletes; so far, there aren’t any apparent side effects. The International Society of Sports Nutrition has deemed HMB safe for consumption, with no adverse issues. As long as you follow the manufacturer’s directions and stick to the correct dosage, you’ll be free and clear. However, as a word of caution: There haven’t been many – or any – tests of HMB and its effect on pregnant women, women who are breastfeeding, or children. If you’re one of these, be careful with dosing. First up on our list is the trusty brand Optimum Nutrition. This HMB supplement comes in capsule form, with 90 servings of 1 gram each. This particular pill is fortified with calcium, which is typical of HMB supplements; Calcium HMB Monohydrate is one of the two versions you’ll see in the market, the other being regular HMB. Both are effective and give you the same results. Optimum Nutrition HMB comes out to 29 cents per pill. This is a tried and true brand, in an easy-to-pack an easy-to-take capsule form. However, you also have to take three of them throughout the day to get the average required dosage. If you love yourself some ON supplements, this HMB is hard to beat. Another calcium HMB monohydrate, but this time it has an added boost of pure calcium. MET-Rx HMB 1000 comes in a capsule, at 1 gram per pill. It includes other ingredients than just the supplement itself; it contains croscarmellose, a type of sodium used as a super disintegrant to rapidly break down the powder inside the capsule. It also has less than 2% of vegetable magnesium stearate, a combination of stearic acids (the saturated fatty acid found in vegetables) and magnesium, as well as silica, a colorless compound found in quartz. This particular bottle is $0.24 cents per 1 gram serving. This is a cheaper alternative to the above option, but it has a slew of added ingredients that may or may not be detrimental to your overall health. If you don’t mind the fluff and want affordable, MET-Rx HMB 1000 is your best bet. Also a trusted source of supplements, BulkSupplements Pure HMB Powder is our first powder option of the list. This is as pure as it gets: beta-Hydroxy beta-methyl butyric acid and nothing else. The serving size is 1 gram – like the others – but you only need half a teaspoon to get this amount. Here’s where this powder becomes a smart option; BulkSupplements powder bag comes with 250 servings. The sheer amount makes this supplement 9 cents per gram. The tricky thing about it is that it’s a powder – tasteless, so you’ll need to mix it in a sports drink or flavored water of some kind (unless you like it in plain water). So long as you’re good with mixing the powder in a drink an hour previous to your workout, BulkSupplements Pure HMB Powder is the cream of the crop. MuscleTech’s capsule HMB is different from the other capsules in that this is not fortified with calcium. They have a patented version of HMB, called “BetaTOR,” which is exclusive to MuscleTech. The serving size is, once again, 1 gram, but it takes two pills to get this amount. It contains the ingredients needed to make a capsule, along with choline chloride (a variety of salt) and silicon dioxide (silica, again). Clear Muscle comes at a cheaper per serving price:17 cents per two capsules. The struggle is it only has 84 servings. If you take a dose three times daily, you’ve only got 28 days of supplement. 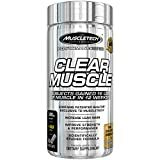 But if extreme affordability is your main focus, MuscleTech Clear Muscle has got you covered. The last one on the list is a Calcium HMB Monohydrate capsule. VitaMonk provides a wonderful supplement that involves little other ingredients; save for the capsule shell itself, there is titanium dioxide, which is the naturally occurring oxide of titanium. You need to take 2 pills to get the 1 gram dosage (which is probably universal at this point). You get 90 servings with this bottle, like the first two choices. However, you can get HMB by VitaMonk for only 12 cents for every pill, or 24 cents for every dose. It’s a tad cheaper than previous options, but at the same time, you don’t get the same trusted brand feel. If brand means nothing to you, and you want an easy and cost-friendly HMB supplement, VitaMonk is your new best friend. PROTEIN SYNTHESIS & MUSCLE GROWTH - HMB (short for hydroxymethylbutyrate ) has been shown to speed up the repair of damaged muscle fibers, shorten recovery time, preserve existing muscle, and increase gains. 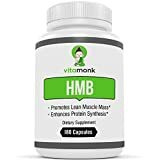 HMB helps maintain the structural component in muscle cell membranes, which leads to less protein breakdown (as a potent anticatabolic ) and can reduce age related muscle atrophy. No artificial fillers. No magnesium stearate or silicone dioxide. BUILD LEAN MUSCLE MASS - Studies suggest that HMB can significantly increase lean muscle mass while simultaneously decreasing fat mass. HMB supplements may reduce the stress hormone cortisol, which causes stress and increases fat around the belly and waistline. SAFE & EFFECTIVE - At VitaMonk we source the highest quality ingredients available and go to great lengths to make sure our supplements meet the highest safety standards. We don't use artificial fillers. 100% MONEY BACK GUARANTEE - You can Buy It Now with no financial risk whatsoever. No matter which one you choose, HMB is your muscle saving superhero. The active metabolite of leucine is tremendous at preserving muscle tissue and recovery after a workout. As an athlete, it can improve your performance, either with your strength, muscle, aerobic, or other fitness goals. While some HMB can be found in foods and a tiny percentage can come from natural leucine intake, it’s best to supplement. The key is to find a dosage right for your weight, then split it up two or three times within a day, especially an hour before a workout. Expect results in between two weeks and a month. Remember: Combining HMB with a creatine supplement could optimize the results you see, while it could be a suitable replacement for that BCAA supplement (if you want to preserve the muscle you already have and forego the three-steps-forward/two-steps-back effect of leucine). Zero side effects, faster muscle recovery, muscle mass preservation? With HMB, you’ll be fast like a bird, strong like a plane, and built like a damn superhero!